I was wiping the sweat off my brow, scanning the jungle canopy we had just broken through, when the old Australian took his first fall. Seventy-two-year-old Will missed his footing and the pull of his backpack threatened to send him crashing onto my head. He lurched forward, instead, and smacked his knees against the stone slope. At that age, climbing any roof is fraught with danger. Will’s peers get their kicks from cleaning the gutters on their bungalows whereas he was ascending 3,143 meters to Indochina’s rooftop at the tail end of the Himalayas. The veteran traveler caught his breath and struggled on, enduring the latest of a string of challenges threading back to the 1950s. Whether he made the top or not, our 10-strong team would venerate his gritty spirit. A number of energetic tourists still opt for the two-day trek to summit Mt. Fansipan, or Phan Xi Pang in Vietnamese, although now there’s a 20-minute alternative that’s made this once remote vista more accessible than ever. After more than two years of construction, Sun Group opened its record-breaking cable car in February 2016. It took off for the first time from Muong Hoa Valley near the holiday boomtown of Sapa. Set near Vietnam’s border with China, the VND4.4 trillion project scooped two records—one for the world’s longest three-rope cable car at 6,282 meters and another for the world’s biggest ascent between the departure and arrival stations at 1,410 meters. Skeptics would be forgiven for seeing these claims as hyperbole dreamt up by some delirious tour operator. The reality, however, is that the pods, carrying 30 to 35 people each, can deliver 2,000 people per hour to the peak; the same number of people who reached the summit over the entire year in 2014. Critics argued the dramatic spike in visitors would spoil the natural beauty of the mountain and strip away its significance as a destination for climbers. Sun Group pressed on regardless. The company has its counter arguments, like the ripe economic benefits such an attraction will bring to the area. It’s also no stranger to controversy: currently its sitting on plans to build another cable car through Son Doong Cave, the world’s largest, after thousands of people worldwide signed a petition to stop it. “Cable car is dirty nature,” said our 20-year-old H’mong guide Nhia. “Broken nature.” The young guide from the village at the foot of the mountain, Cat Cat, speaks his native language, broken English and Vietnamese. Taking the same job as his father, he began guiding tourists up Fansipan four years ago. Nhia skipped over a stream to fetch some wild berries, his fruit picking punctuated by laments of a drop in climbers since the cable car opened. Although Hoang Lien Son National Park pays him a fixed wage of VND300,000 for every two-day trek, fewer climbers means fewer tips and a more vulnerable future on the mountain. The prospect didn’t seem to dampen his spirits too much. Sporting the classic H’mong footwear, a flimsy prototype to Crocs, he yo-yoed up and down our pack, blithely ripping bits of cardamom leaves and thorny coriander for chewing. This cheerful manner persisted, despite the fact that Nhia’s family was rocked days before by a loss not uncommon in the mountainous region around Lao Cai and Sapa. He would come to tell me about it after a few hours of rambling together. Blissfully unaware, I stumbled across the roots of beech trees to the lunch spot at 2,200 meters. After this point, the trail turned from dense jungle to forest. Wild orange and white orchids, magnolia and blossoming red azaleas colored the narrowing ridge. Mountain toads croaked in a pond off the bushy, rolling path and, in the distance, mist spread across the craggy peaks, enveloping the cable car and, eventually, the walkers in front of me. Over 2,000 species of flora and 327 fauna species have been discovered on Fansipan so far. 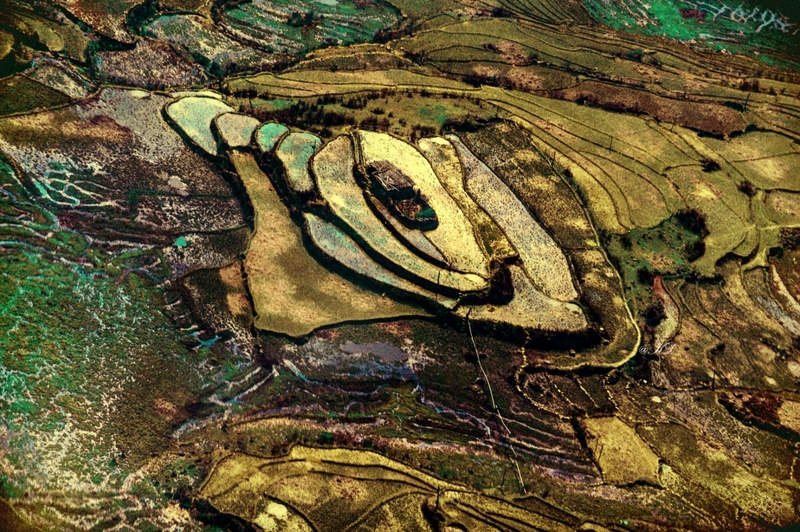 Nature perpetually replenishes the landscape, seen in the blackened patches of deforestation that are hastily filled by clumps of dwarf bamboo. Whether this environment could live in harmony with the breaching wave of sightseers is a question that has worried many, but, like the rest of Vietnam, the north is facing unstoppable change. With that change is the Faustian sting of mass tourism. 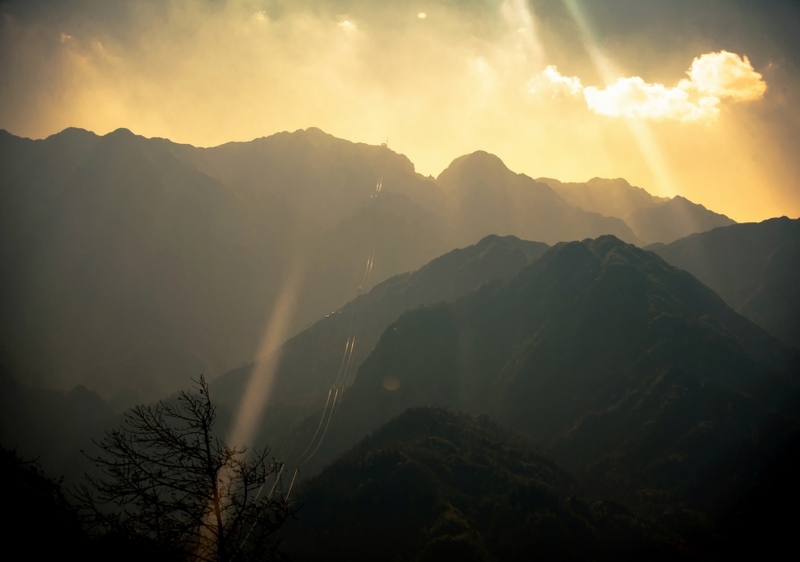 Often described as Vietnam’s very own Swiss Alps, Sapa has always been a desirable location. The town was a fashionable mountain retreat for Hanoi’s colonial society in the first half of the 20th century, and then its glamorous epoch was stunted by war and hardship. 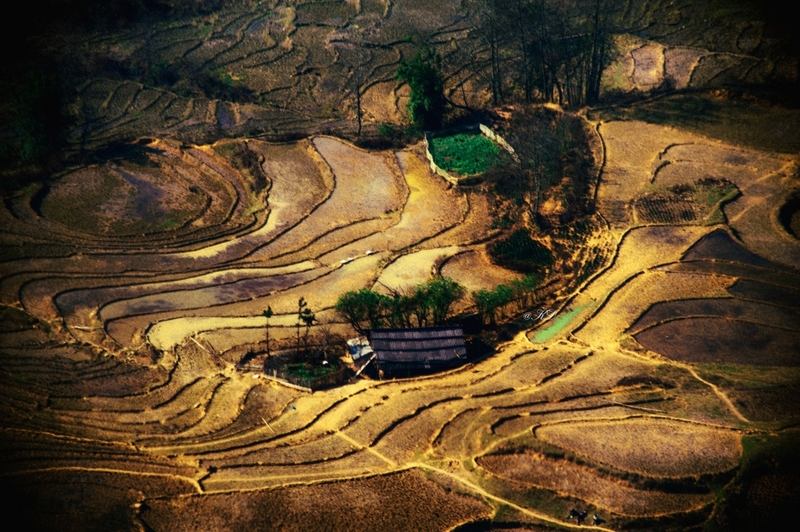 During the 1990s, the reviving tourism industry helped lift Sapa out of stagnant poverty. 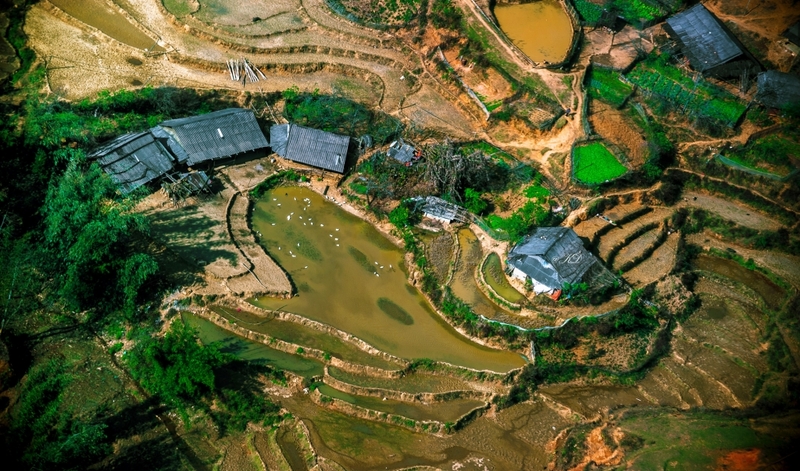 Now, more than ever, the local H’mong people are diverting their focus back to domestic and international travelers again. Handicrafts, jewelry and courting dances are being packaged into novelty experiences for visitors while traditional forms of income, like agriculture, are taking a backseat. The influence of new money has given the town a cynical edge that expresses itself through peddlers chasing tourist buses and resenting the passengers inside. 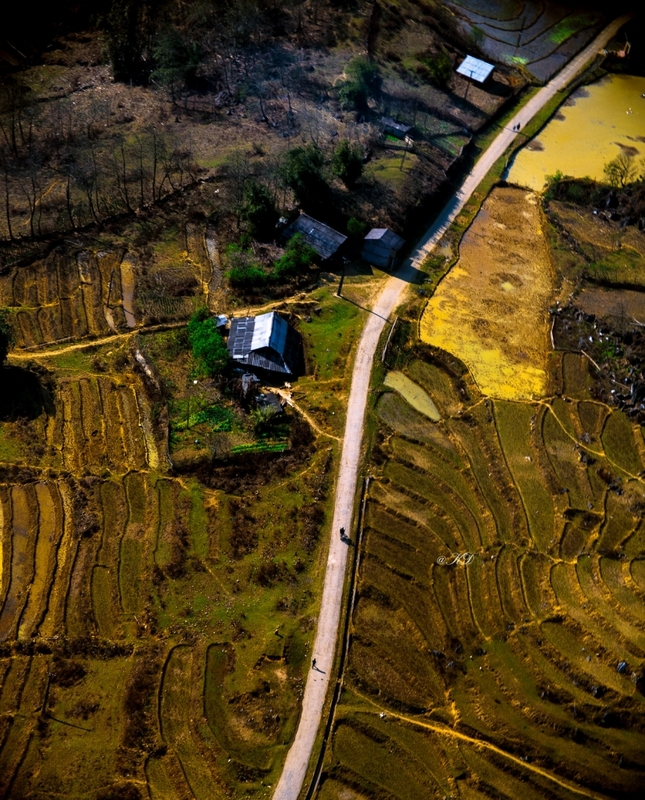 People still come though, because the beauty of the people, with their hemp clothing dyed with indigo, and the unblemished landscape can be easily found in one of the remote villages outside of Sapa. Ultimately, if tourism is helping put food on the tables of the indigenous community, authenticity loses its importance. The complex Ylva mentioned was about three hours from base camp—tin shacks set at 2,800 meters—where the two porters waited for us. Carrying towering crates of eggs and other provisions, these women had no idea they had won a race against two competitive Dutch students in our group. We feasted on beef, tofu and rice. A rooster’s head that was balanced at the top of its barely cooked limbs was offered, too, but with its glazed eyes staring grudgingly at the diners, there was a silent consensus to leave the bird alone. The night was filled with noises of scratching moles, rodents’ tapping feet and cats’ screams. None of us had expected a stay at the Hilton, besides, we were off again at 3:30am. We scrambled up ravines, ladders and a rope in the darkness, hoping to make the summit in time for sunrise. Our bodies were aching: the trek demanded a good level of fitness without a lot of mountaineering experience. The track became dense again, this time with thickets of bamboo. I looked down to see a sludgy mess of toilet waste, about 20 minutes from the top. It was oozing from the construction site; the pagoda and shopping complex, which looked some time from completion. We both failed at suppressing a laugh. I asked Nhia if he had plans later that day. He was going to visit the body of his father-in-law who was decapitated in a motorbike accident on the treacherous route from Lao Cai to Sapa two days before. Coincidentally, I had been stuck in the unfolding traffic jam. A large truck stacked with cages had crashed into the side of a bridge, and seemingly, Nhia’s family member. It was a reminder that no matter how many restaurants or cable cars the area gets, traveling on the far north’s winding roads should be done with caution. The summit was whipped by rain and the view drowned in fog. Considering the wet season was well underway, we had been lucky with the weather on the climb. We’d been told to anticipate bad conditions at the top. Perhaps the real surprise was the strong sense of accomplishment we all shared. The old Australian was the last to arrive. He clambered up the final step, blood dribbling down his forearm from a fall in the bamboo. “We few, we happy few, we band of brothers,” he said with Shakespearean spirit. He was right for the moment, but in one hour’s time the spot would be chockablock with cable car passengers who had trod up 600 steps for the inevitable selfie fest. More than half of our group felt too tired for the descent and returned in the cable car. Will breathed in the air, picked up his backpack, and began climbing back down. Indochina’s highest mountain will continue to be more than a cable car ride for those who dig a bit deeper.